Ohid Sarder prises a rusted nail from a tree and drops it into his bucket, another eyesore scrubbed from the countryside as he embarks on a one-man mission to clean up Bangladesh. The 53-year-old self-professed tree hugger has been riding his bicycle across the country, in a grassroots effort to free trees of the billboards and clutter nailed to their trunks. Trees in Bangladesh are often used as free advertising space, with every available inch of wood plastered with placards until the trunk is barely visible. 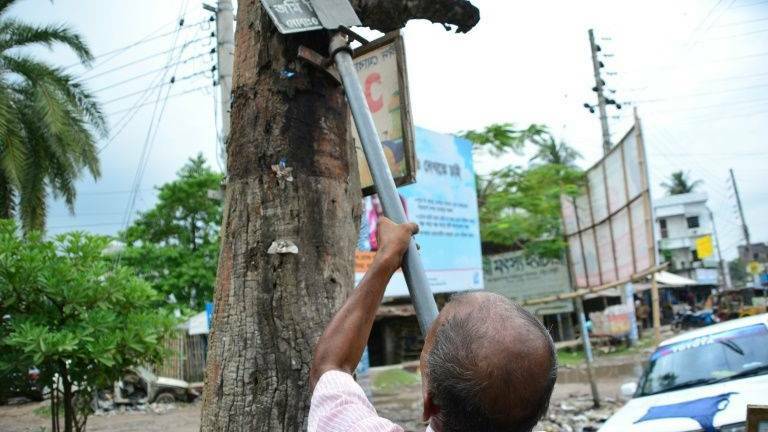 The billboards might disintegrate over time but the nails remain embedded deep in the wood -- agitating tree-lover Sarder, who has devoted his life to healing these wounds. "Trees have life. They feel pain just as we do," the self-styled conservationist told AFP in Jessore district in the country's southwest. "I have seen how these nails have killed trees, and how they are causing them pain." Sarder grew up idolising Jagdish Chandra Bose, a prominent Bengali botanist who wrote about the emotions of plants in the early decades of the 20th century. Inspired, Sarder began planting trees in Jhenaidah, his home district, and neighbouring Jessore, a passion he kept up for decades. But this year it occurred to him that planting trees was not enough -- he needed to protect those already under threat. Traversing battered roads with a bicycle, bucket and a metal rod welded with prongs, Sarder began prying thick nails and spikes from abused trees across the country. Since he began his beautification drive in July he has collected more than 80 kilogrammes (176 pounds) of them. "It looks easy, but it isn't. It takes a lot of effort to pull out a rusted nail that has been there for years," he said. It is arduous and thankless work. His wife complains that Sarder, a mason by trade, spends more time with his trees doing unpaid volunteer work than earning a wage. Often, he doubles back on a section of road to discover fresh billboards hammered into his beloved trees. "You know what breaks my heart the most? Most of these banners are advertising doctors, lawyers, tutors and other clinics," he said. "They all are well educated. Why on earth can't they refrain from destroying a tree?" Sarder often attracts crowds of curious onlookers as he goes about his work. "No one really does this work. People thought I was crazy," he said. But sensing an opportunity to educate the public about his mission, he attached a placard to his bicycle extolling the benefits of trees and merits of conserving nature. "I try my best to explain the importance of having more trees and inspire them to plant and save more trees." Sarder has appealed to local politicians to try and outlaw this form of vandalism, but has not had much success. But he intends to keep up the fight, saying a growing awareness of climate change and environmental conservation in his impoverished homeland could spur change in the future. Bangladesh, a low-lying riverine country of 160 million, is particularly prone to floods. Experts say trees, by soaking up water and reducing soil erosion, can help mitigate the devastation brought by yearly deluges. "What we have failed to understand is that to keep the balance in nature, we need more trees," he said.